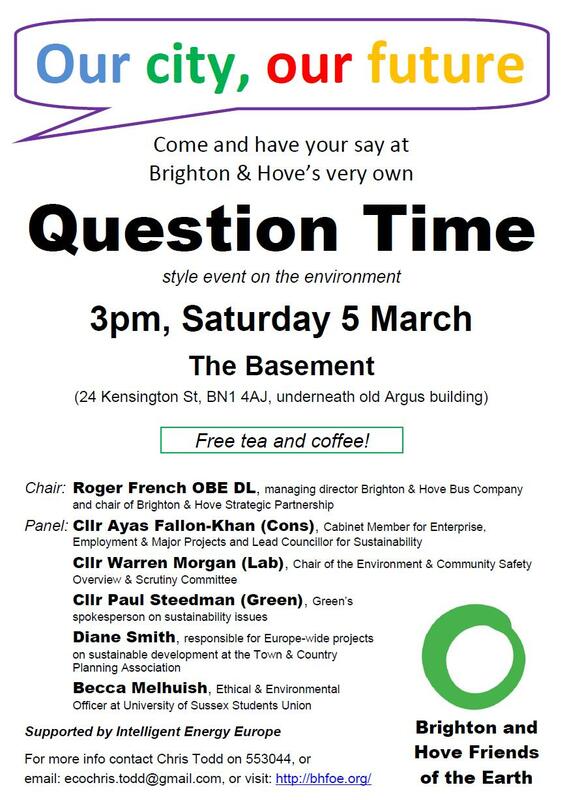 Brighton & Hove Friends of the Earth (BHFOE) is holding a Question Time style event, called „Our city, our future‟, 3pm, Saturday 5 March at the Basement in Kensington St, Brighton . This is part of the Intelligent Energy Tour by Energy Union , coming to Brighton in March. BHFOE wants local residents to suggest ideas on how the city can minimise its impact on the environment . The aim is to achieve consensus on what is possible and to get politicians to commit to take things forward. Ideas can be left at the exhibition in the foyer of Jubilee Library in the week before the event on a large wall display. These will then help steer the debate or, even better, people can turn up on the Saturday and take part directly. The city recently failed to achieve its target to reduce carbon emissions  while a new report from Friends of the Earth warns that politicians are acting too slowly in tackling climate change with potentially dangerous consequences . Locally, there are strong concerns about local food production, waste and recycling, air quality and provision of green space.  Becca Melhuish, Ethical & Environmental Officer at University of Sussex Students Union . On the same day, the University of Sussex Green Week is being launched in Jubilee Square and BHFOE is working closely with the University and the Student‟s Union to link the two events together . “Time is fast running out. Despite all the talk and the many good initiatives in the city, we are not reducing our carbon emissions or our impact on the environment fast enough. We‟ve got to think more imaginatively and be bolder in our ambition. This event is hoping to kick-start the process by challenging the politicians to deliver. We need action and we need it now. 1. Energy Union is a pan-European campaign tour supported by the European Commission to promote Intelligent Energy in an innovative way and has been organised to minimise its impact on the environment (see: http://www.energyunion.eu/ ). After a successful tour in 2009 and 2010, with more than 20,000 visitors in 20 cities, The Energy Union Tour will visit Brighton for an impressive penultimate event. This will combine a daytime exhibition and discussion programme (‘Our City, Our Future’) from 1st – 5th March at the Jubilee Library in association with BHFOE, as well a highly anticipated show featuring Coldcut’s Matt Black (Ninja Tune) and the awesome Skrillex on his European debut tour on 5th March, 11pm – 4am @ Coalition, 171-181 Kings Road Arches, Brighton. Price for the evening show: Limited Advance £8; £10 advance; more on the door. 2. The Question Time style panel event starts at 3pm at The Basement, underneath the old Argus building in Kensington St. Entry is free and there will be free tea and coffee provided and there will be a chance to carry on debates and discussions in the bar area after the event. 3. It is the current Council administration’s ambition to become a low carbon city and in the city’s Sustainable Community Strategy there are challenging targets to reduce the city’s carbon emissions and its ecological footprint (its environmental impact) (see http://www.bandhsp.co.uk/index.cfm?request=c1222847 ). 4. Over the last 3 years the city has achieved a 6.12% decrease in emissions compared to its 12% target (set out in the Local Area Agreement). This is little different to the average cut in emissions nationally, despite Brighton & Hove being seen as a ‘green’ city. 6. More detail about the panellists is available on request.